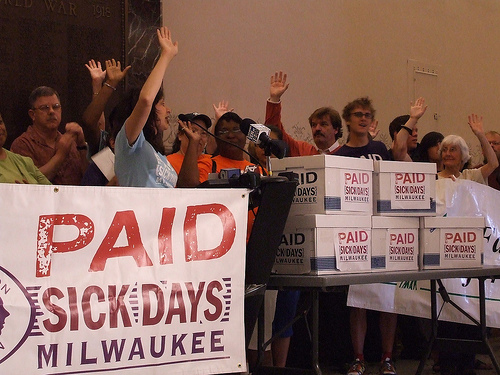 In November ’08, city of Milwaukee voters approved a sick pay ordinance with 69% of the vote. Such margins of victory generally prompt folks to proclaim, “The people have spoken.” Such descriptors as “overwhelming” and that old standby “landslide” get bandied about. Are you sick and your boss wants you to come to work or dock your pay? Tough noogies, they, including the Metropolitan Milwaukee Association of Commerce, say. Your kid is sick and needs to stay home from school, and you don’t want to leave her home alone? Sounds like a personal problem to us. I’m translating business-speak into plain English here. Actually, they – along with Mayor Tom Barrett – are saying that this will put Milwaukee businesses at a competitive disadvantage because businesses in other cities in other counties get to be as cruel as they need to be to protect their bottom lines. This, to create jobs in which they can dock pay from you for being sick and that they can fire you from if you have a sick kid. To save Milwaukee from the horrors of good public health – want germs with that burger, sir? – and making Milwaukee a great place to work, the Legislature has made it unlawful for cities to set sick days for businesses in their communities. Instead, the cities will have to follow the state template on family and medical leave. Which doesn’t include sick days. Got that? The Legislature will impose a fix for Milwaukee’s sensible detour into workplace sanity by imposing its own policy on sick days, which amounts to no policy at all on the topic. It is resorting to this because MMAC exhausted its immediate legal remedies. After much legal wrangling, including a 3-3 state Supreme Court tie, an appeals court upheld the ordinance. It’s legal, in other words. No problem. The Legislature, restrained only by how high the ceilings are when business says “jump,” just redefined what’s legal. Tim Sheehy, who heads MMAC and is a genuinely nice guy, by the way, said that most large businesses already have generous sick day policies. His group’s concern is a requirement that sets inconsistent rules across the state, affecting businesses with outlets across the state. Smaller businesses, but I’m guessing he means other businesses as well, “don’t need an arbitrary standard of care on how to attract and keep” employees, Sheehy said. Businesses, in fact, resist anything that threatens prerogative and profit, though it’s unlikely that providing sick days does this. There is evidence to the contrary. So, businesses have fought everything from minimum-wage increases to smoking bans to eight-hour workdays to laws banning discrimination to the very state act that the Legislature is now using to pre-empt local voters. You’d think that track record would tell us something. But, OK, this is what businesses do, through groups such as MMAC and Wisconsin Manufacturers & Commerce. Tax breaks, relaxed regulation, having the Legislature pretend climate change isn’t real – all fine. A break for workers never seems to be on the agenda. For that, there is union influence. Oh, right; sore topic. Sorry. Let’s not go there. Oh, I forgot; the smoking ban. Folks crying about local control now weren’t shedding tears over a Legislature-imposed ban statewide. Right. But do you recall an overwhelming local vote banning smoking bans? I don’t. And weren’t the anti-ban folks the ones mostly kvetching about local control back then? But the policy matters in any case. Smoking bans save lives. Sick days better lives – and workplaces. Can’t have that. That’s because, with the collective bargaining law, the Legislature and governor have evidenced abundant anti-worker sentiment. This pre-emption seconds the motion. And, with sick days, they will be saying that direct democracy is only what they say it is. This entry was posted in Business productivity, Healthy workers, In the news, Paid sick days and tagged business, milwaukee, Paid sick days, wisconsin. Bookmark the permalink.